I kinda thought today might be good for rarities... Turns out I didn't see that much in the way of numbers - but there was definitely rarities around! To start, I didn't see the Western Grebe or the Smith's Longspurs - but it's my fault (I didn't look)... Whenever rarities start showing up, I get excited about finding my own and end up missing out on the "birds of the day"... What can ya do? 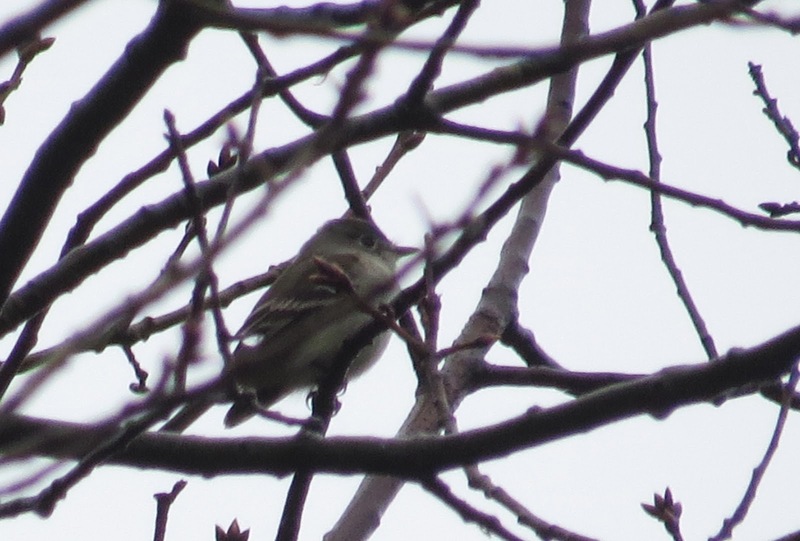 I think this bird (above - young female) is 90% Myrtle and 10% Audubons... I'll leave it at that. Long day (walked 23ish km) - hoping tomorrow is great! All depends on the rain and winds... I think rarities will be around no matter what though. It's an exciting time! 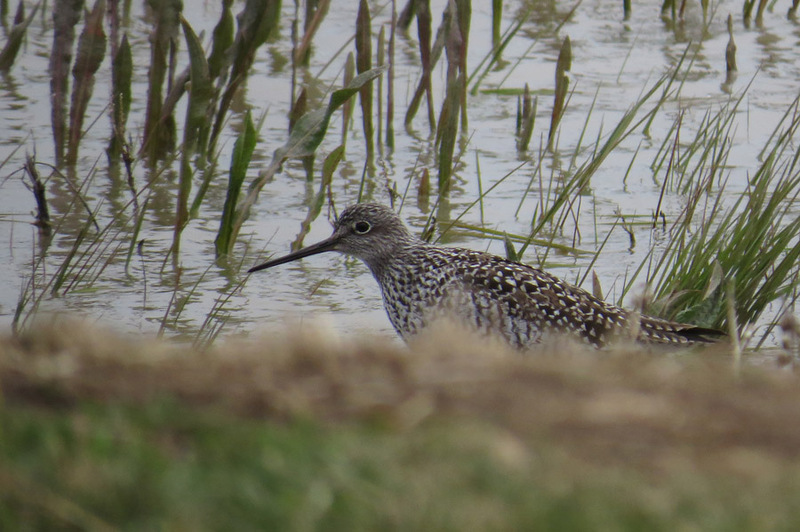 Underrated beauty - a Greater Yellowlegs in breeding plumage! Pelee!!! Sure, I didn't get back until maybe 5pm - but that doesn't stop me from doing some damage!!! Wheatley Harbour - slowwww - big waves though... And Common/Forster's Terns about. Hillman Marsh Shorebird Cell - boom! 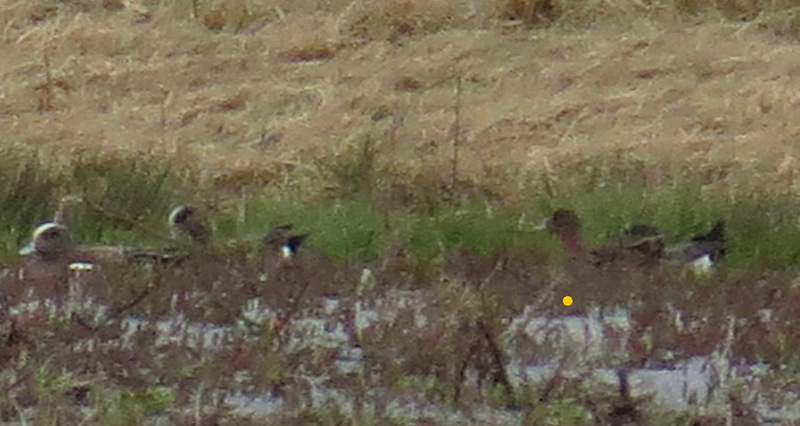 1 EURASIAN WIGEON (female to boot) that I picked out soon after arriving. 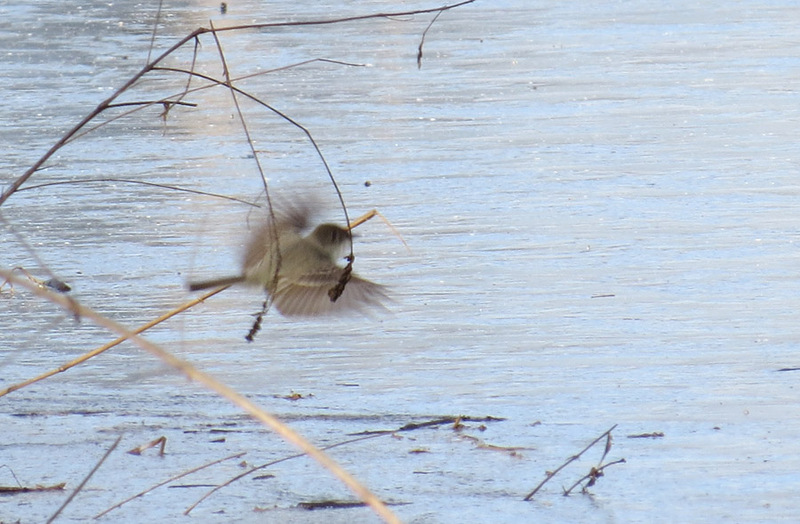 A bird i've long searched for in Ontario (sorting through plain birds for plain rarities seems to be a hobby of mine). It was all reddish/orange washed on the head and lacked any black at the base of the bill. Perfection! 1 Marbled Godwit - beauty!!! Walked in front of the wigeon to reveal itself. 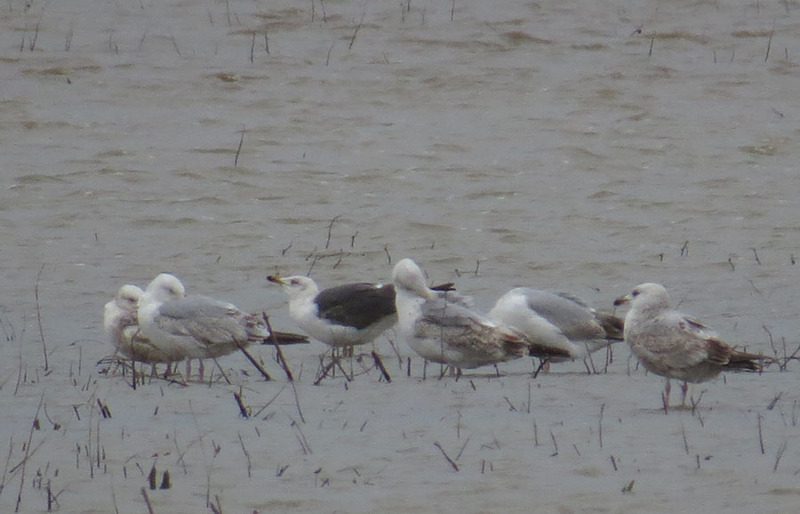 1 Lesser Black-backed Gull - 3rd alternate. 3 Great Black-backs, 1 Caspian Tern, Forster's etc + the expected shorebirds and ducks. There are a ton of teal here - I'm hoping for a Garganey! Or a Cinnamon! 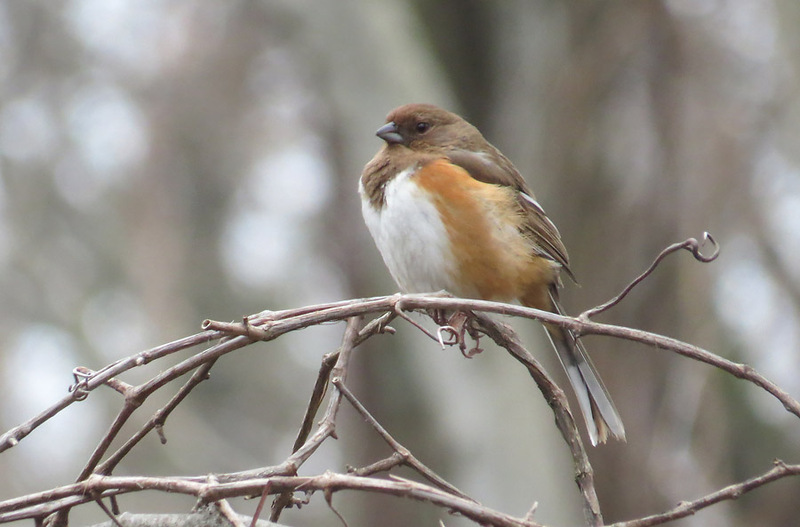 Tuesday birding forecast - Very good in SW Ontario?! I'm loving these new maps from tropical tidbits!! 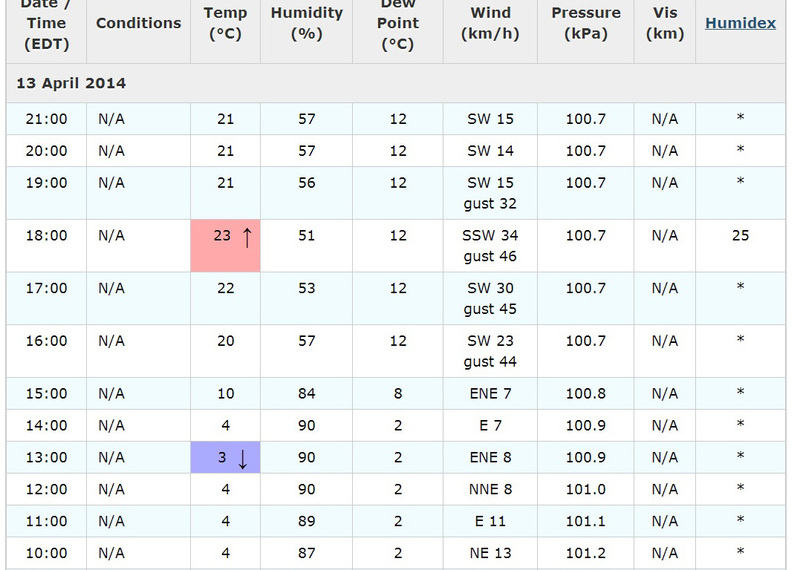 It's showing 2am local for Pelee - STRONG SW winds pushing into the Pelee area, and rain should be heavy - but hopefully ending by morning (and I hope - with birds riding the back side of the rain).. I'm not really 100% sure about this one, but it doesn't hurt to have high hopes! 8am for Tuesday (GFS model run) - hopefully the rain is pushing past Pelee in time to drop some awesome birds. It's right on the edge!! 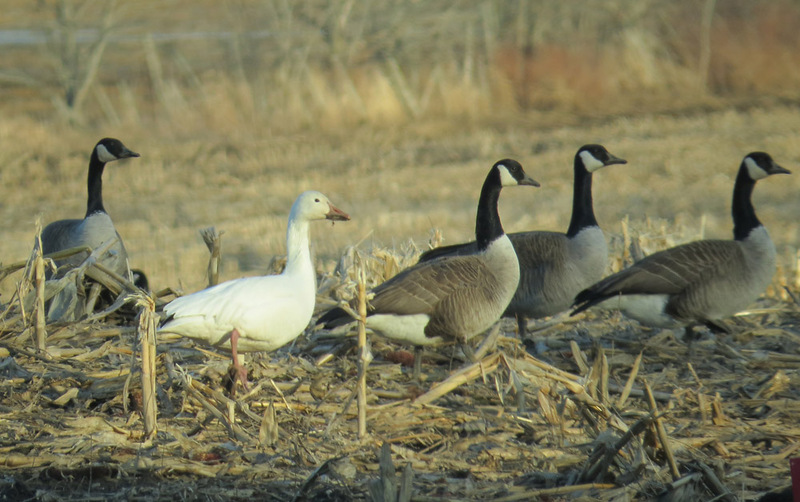 The low is being blocked, and looks to be trying to get "cut off" - I typically like these lows (that wrap around themselves) - in the fall, but what the heck - let's see some good birds!!! Make sure you keep tabs on those Newfoundland blogs along the side bar! They're just getting warmed up with euro-vagrants out there. Looks pretty darn exciting! 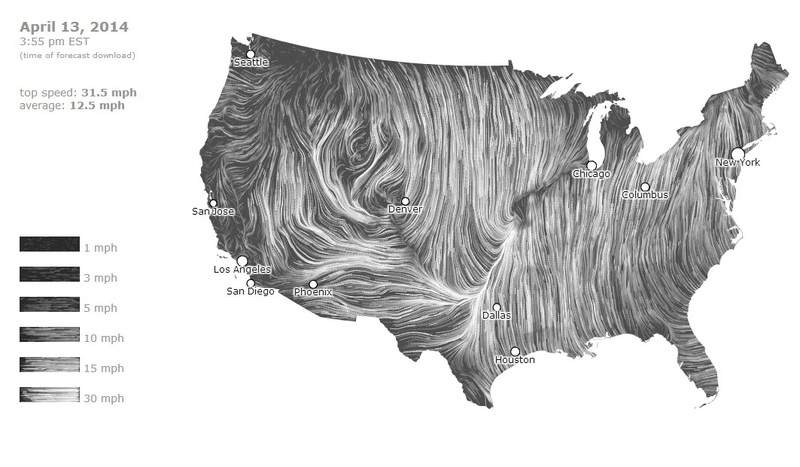 I'm on bad internet, so I can't really keep track of what's happening with the severe weather in the USA - but it looks pretty cool. I'm hoping to be back at Pelee by late this afternoon (this is pre-written Sunday) - so I'll have more birds and weather to report later! 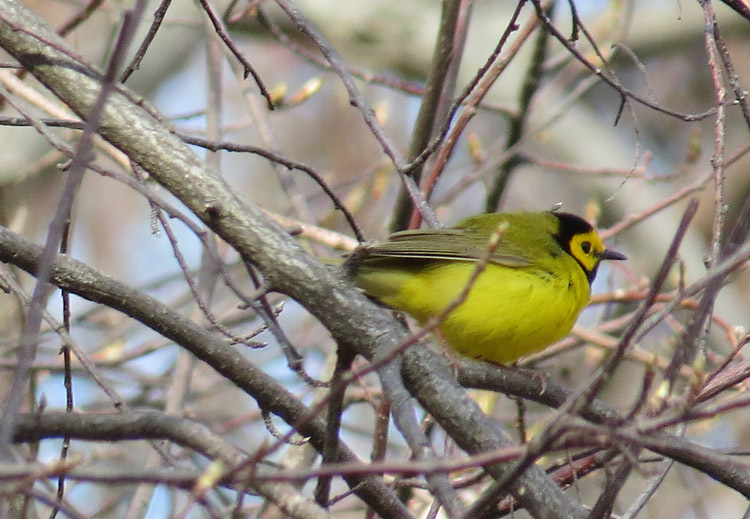 I had the Hooded Warbler sing while riding the tram! Near it's spot (N of sparrow field). 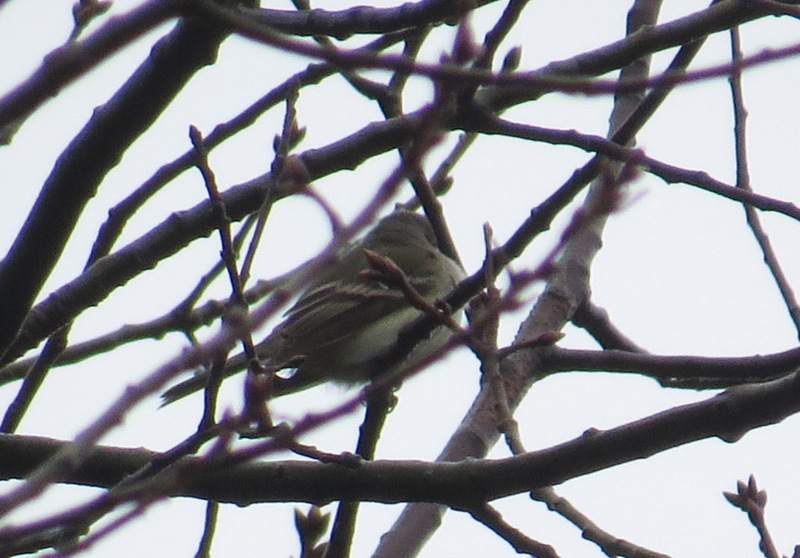 There are still 1-2 American Tree Sparrows around the tip, which seem a bit odd! Although there's still snowdrifts along the west beach, so I guess it's ok... 3 Sandhill Cranes were on the east beach with a few turkeys.. Looked odd... A male Merlin was hanging around. Only 1 Carolina Wren in the last 3 days! I didn't check hillman and had little in the fields... Wheatley Harbour was dull to say the least! On the drive home, I had 200+ Broad-winged Hawks along HWY 3 !!! They were seriously getting pushed south in due to the strong N winds... They must be really late in their spring migration... So much north winds!!! I've also temporarily lost my card-reader, so any warbler photos from today will have to wait (or be forever deleted). My Dad had the Yellow-throated Warbler again today on WNT, and there were Marbled Godwits!!! So the fun never ends at Pelee. 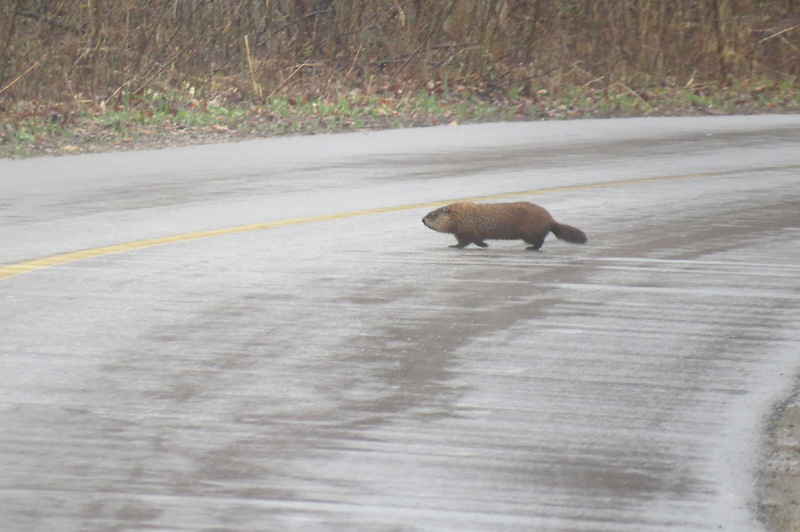 This is THEE GroundHOG from Pelee on the 25th... Has anyone ever seen one in the park before?! I meant to ask Alan today - but I forgot.. Alan? I know it was my first! Lots of great rarities around the continent in the last few days. You'd think it was nearly MAY!!! It's mostly yellow - has little streaking (but is reddish) and looks awesome. I'm counting it! Ken is leaning towards Acadian... I agree with him (and not just out of fear). Oh - I also saw a groundhog inside the park today.. (Ken and I) - is that normal? 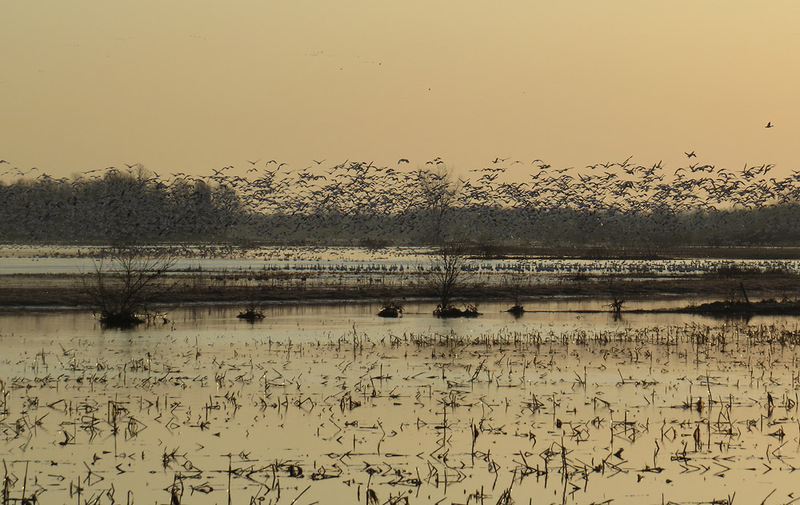 I drove past Roberta Stewart Wetland and saw the same birds Blake Mann keeps seeing! I passed some wetland that I forgot to note the name of! - But it had Pectoral Sandpipers and a Sora calling... Nice spot! 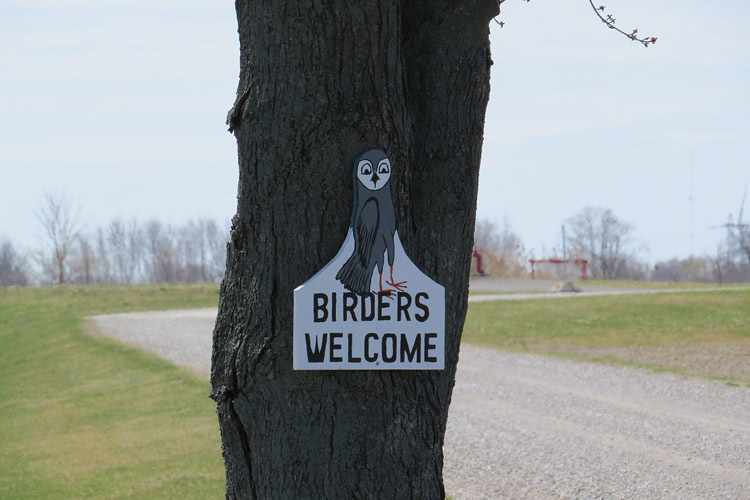 This sign was AMAZING to see while at Tilbury... How often do you see something like this? Wheatley Harbour - pretty boring... Although 2 Green Herons at Muddy Creek were very nice to see! A quick check of the hillman bridge had lots of shorebird habitat!!! 200 Dunlin, both yellowlegs, Pec's, Wilson's Snipe and my FOY Spotted Sandpiper! It's lookin decent..
From the road I could see a number of Gulls and ~7 Black-bellied Plovers in the shorebird cell, but I didn't go in! 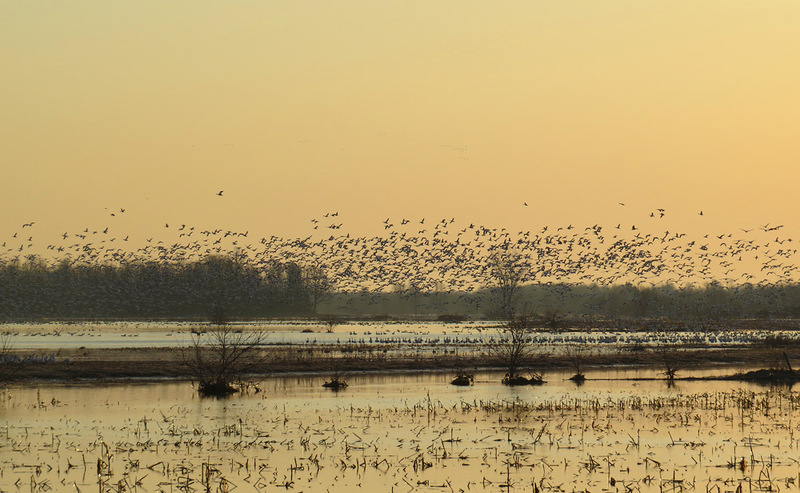 In the evening, I had the chance to see huge numbers of teal in the cell. Overall a good start! Tomorrow (today) - friday - looks like it could get rather exciting. Expect the first week of May to be COLD! Pelee Pelee Pelee!!! A few years ago, I made this image - which was pretty popular methinks.. So what do you think? Look good? Which is beter? 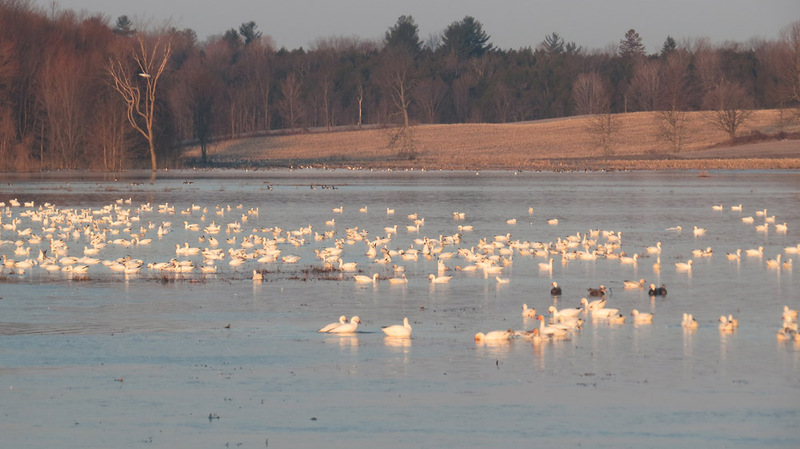 What's Pelee going to be like in 2014?! Severe weather outbreak in USA = Mega's for the Great Lakes?!?!?! I think they're starting to make sense though! Or at least, I hope they are... 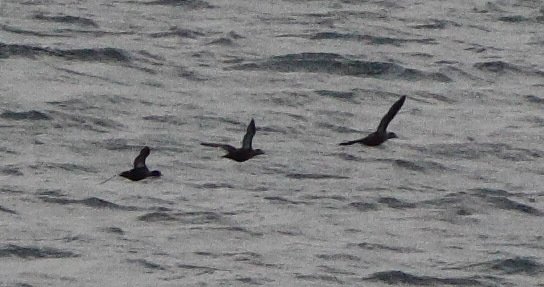 If my understanding is correct, we may be rather chilly - but in a darn good position to land a truly mega-rare bird! On the ground, we'll be getting blasted with strong NE winds. In the past, I have been confused as to why MEGA rare's have often arrived BEFORE we feel warm temps and south winds on the ground... I can only assume it's because the warm air is "riding up" and the birds are flying ABOVE the NE winds, and are eventually grounded when they encounter them (or rain). SPC severe weather outlook for 4-8 days out - those colour patches are for Saturday, Sunday and Monday. 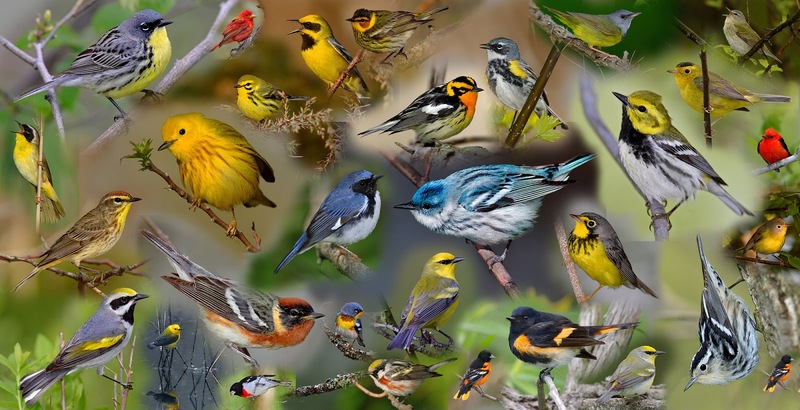 May 3-11 2003 - very large/prolonged outbreak - 2 Hermit (accepted), 1 Virginia's (accepted) and 1 Red-faced (not accepted) Warblers reported in the province. Apr 30 - May 2, 2010 - outbreak - Anhinga in SS Marie. Those are just a few samples... Some have almost nothing associated with the outbreak (in Ontario) - whereas others had noticeable spikes in OBRC birds reported, just nothing "insane" - A huge outbreak occurred in late April 2011 - see here - and the birding was AMAZING - although the OBRC records don't' reflect that... (Ken Burrell and I found YT Warbler, Eared Grebe, Glossy Ibis, Laughing Gull and an ad. male Summer Tanager in 24 hours on Pelee Island). 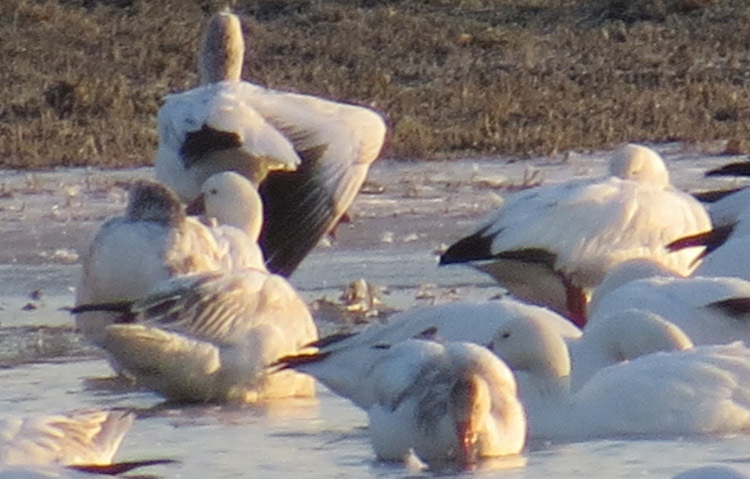 It was my first time seeing huge flocks of "Greater" Snow Geese - they're really freakin big! 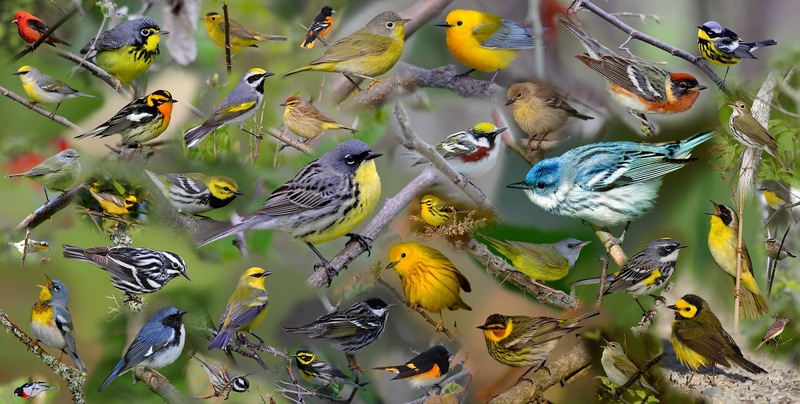 (I had seen the subspecies before, just not thousands).. 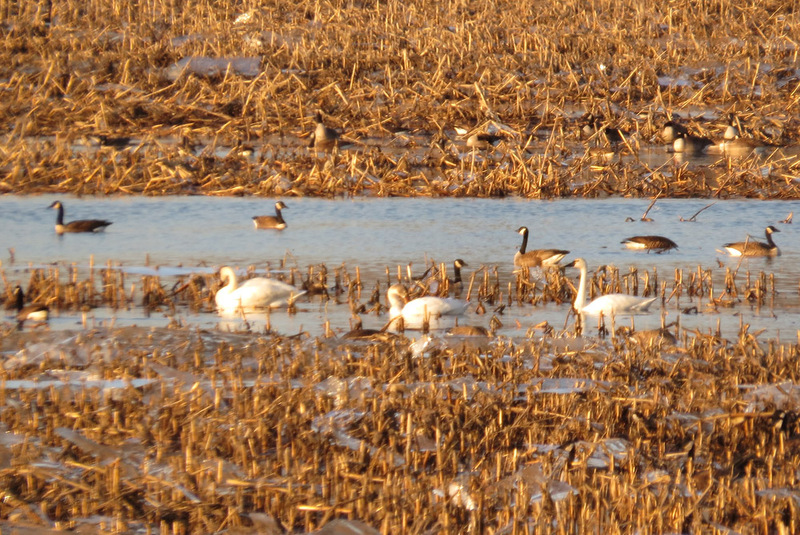 Some other highlights were a Sandhill Crane and 6 Tundra Swans (some shown above) - decent birds for far-eastern Ontario methinks? 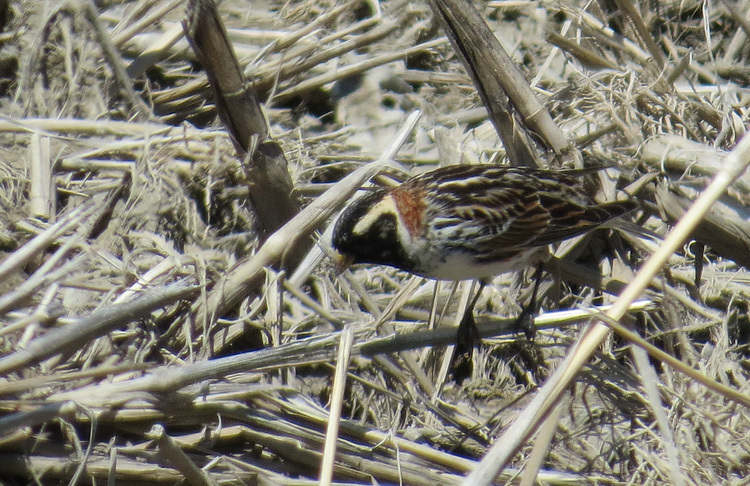 Smith's Longspurs are moving through Ohio/Indiana etc... 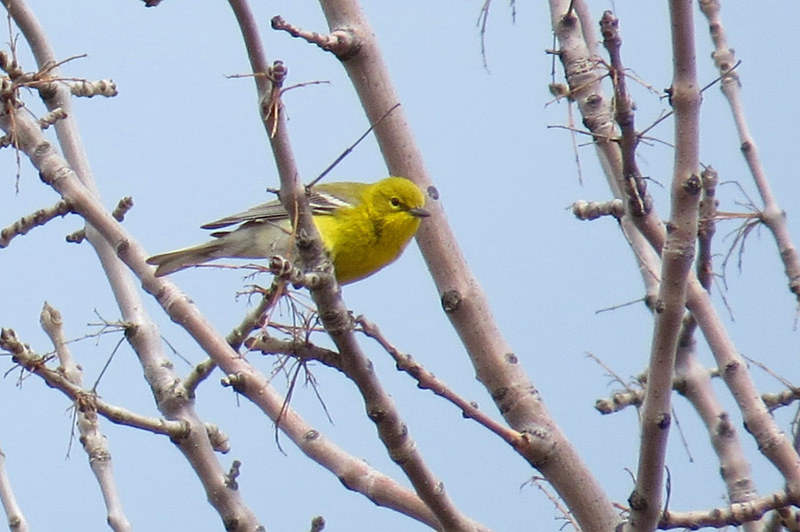 It still boggles my mind that Pelee doesn't have a record of this species! April 13th conditions at the Burlington lift bridge... What a change!!!! Watch this space for all your rarity-weather news!!!!!! The weather forecasts shifted today for some (possible) AWFUL weather for late april, so here's hoping it improves! Everyone (bloggers?) 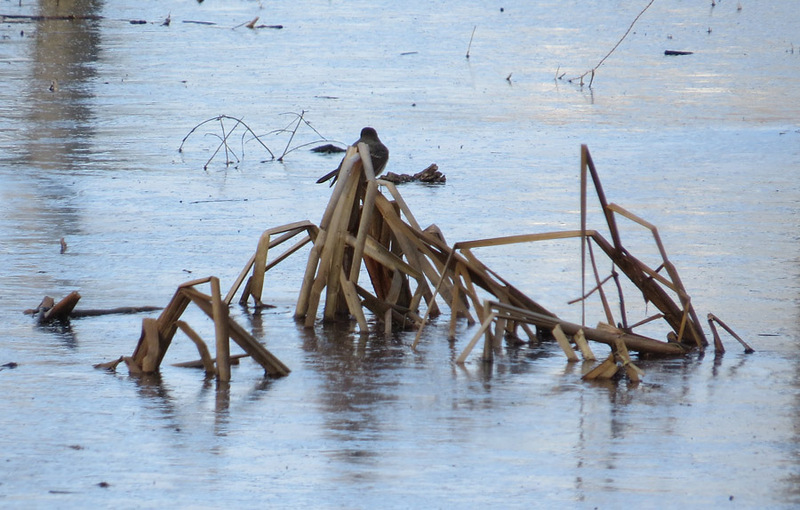 had their chance to share their little moment last week where birds were dealing with the cold/snow... 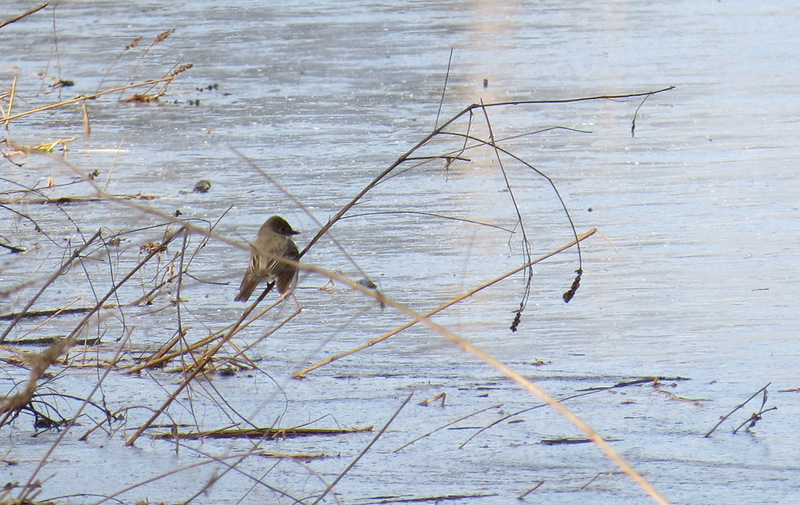 Mine was watching a group of Phoebes "flycatch" off the surface of a frozen swamp.. Phoebes and Ice! On the brightside, all extreme/severe weather outbreaks for the next 6 weeks will bring us insane vagrants - instead of "just" snow and cold! 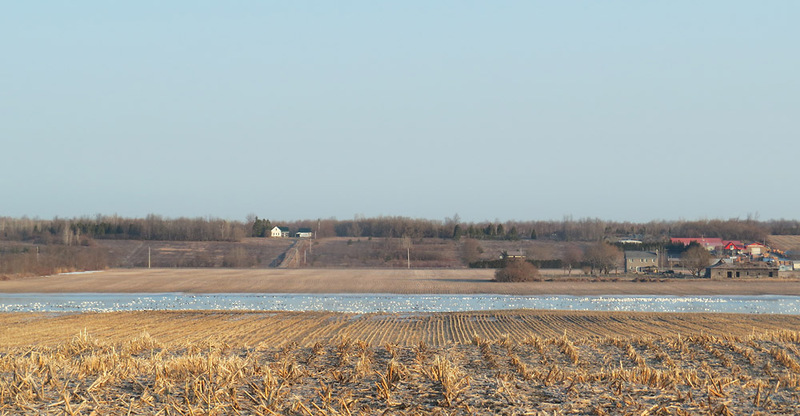 I updated the blog header to a new "pelee edition" a bit early, but thought it would counter balance this icy post! 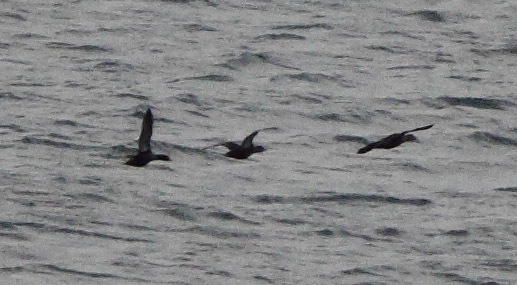 Two snaps of the King Eider "flock"
2 Blue-winged Teal - NEW condo BIRD(s)!!! Overdue, but I'll take it! GREATER WHITE-FRONTED GEESE - 2 ! I picked up on these two small geese - flying waay out over Lake Ontario (going east)... I snapped three photos (shown above) and looked at them in my scope. Only one problem - they just looked dark in the crummy light! I could tell they weren't Canada's - and didn't look great for Cackling either... After a very limited amount of research, I figured they weren't Cackling or Brant due to their long necks (both species have very short necks)... A bit of a stretch I guess, but what the heck - it's just my patch list. KING EIDERs - 6! 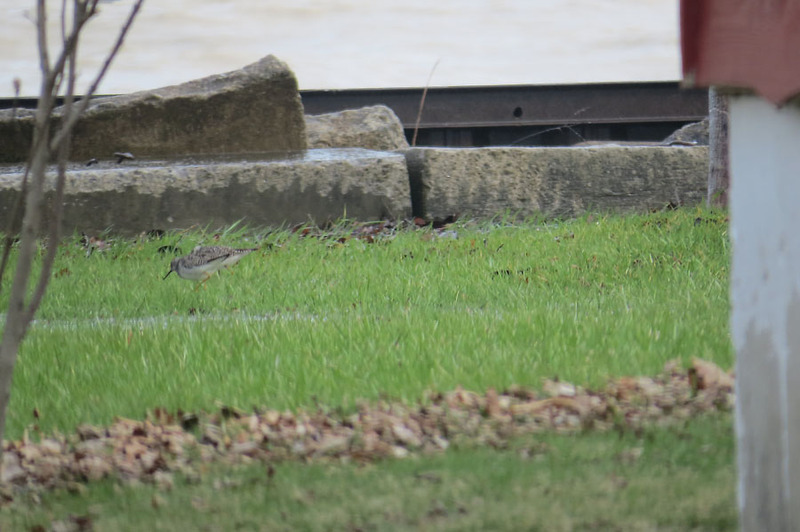 (yes six) in a single flock feeding offshore of LP Sayer's park. 2 young males, 4 females! Great Egret - 1 ! Northern Flicker - 100+ !!!!!!! FORSTER'S TERN - 1 !!!!! New condo bird!!!!! E. Phoebe - landed on the roof of the next condo building! Northern Flicker - hundreds... 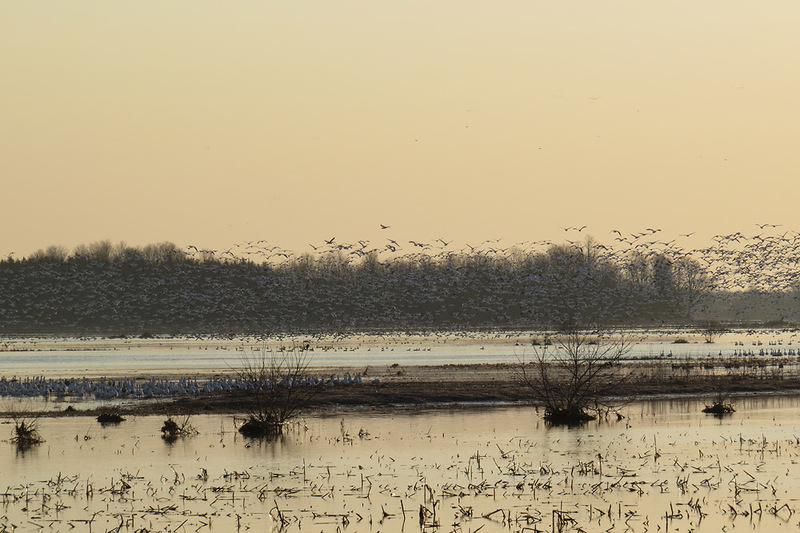 I would guess they were averaging 1.5-2 per minute, for 4-5 hours straight in the morning... That's easily over 300 birds! 400 wouldn't be crazy, based on the numbers - but I had no desire to sit and count flickers all morning! They are awesome to watch though - so colourful! Once again, species that were notable just days ago (Barn Swallow, Common Tern etc) - were like an afterthought today... I listed species above like the Sapsuckers and Fox Sparrow - not because they're unusual - it was just unusual to see them flying past while inside my condo. Pretty fun! 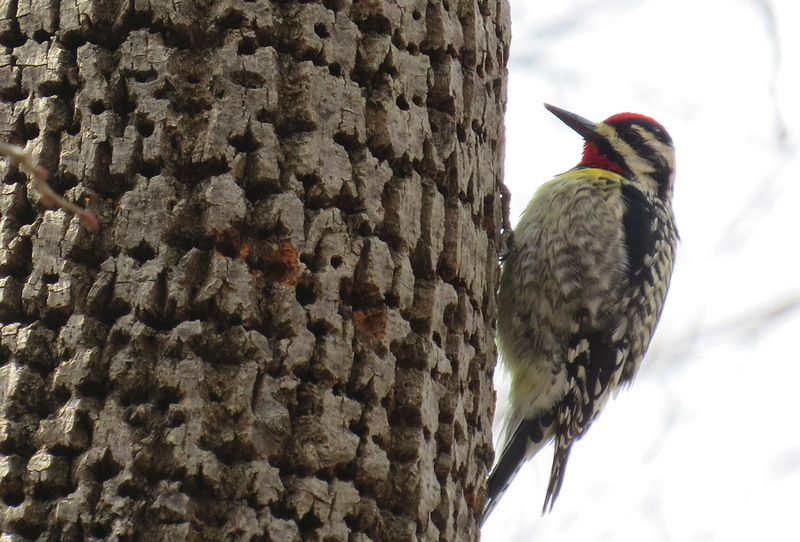 I could only imagine the nearby woodlots had a lot of birds! I also stopped keeping track of the ducks.. 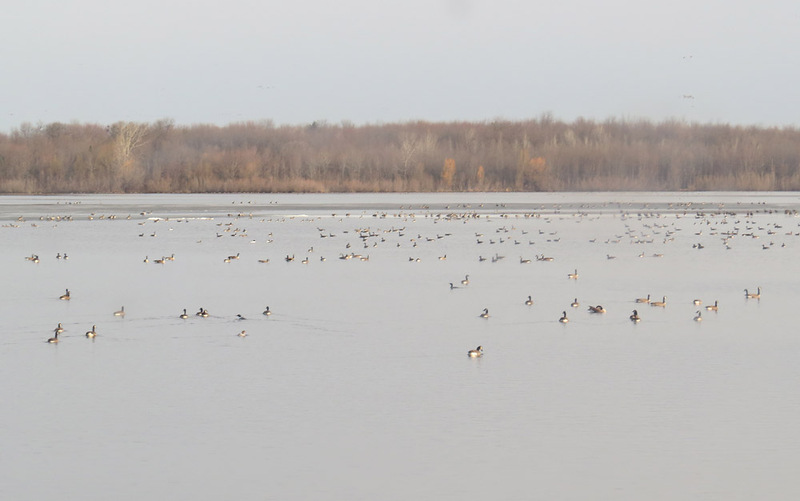 I had species like Scaup (big flocks) Pintail, Wigeon etc... My desire to check the woods panned out in the afternoon. Walking from my condo down Van Wagner's Beach was the destination. 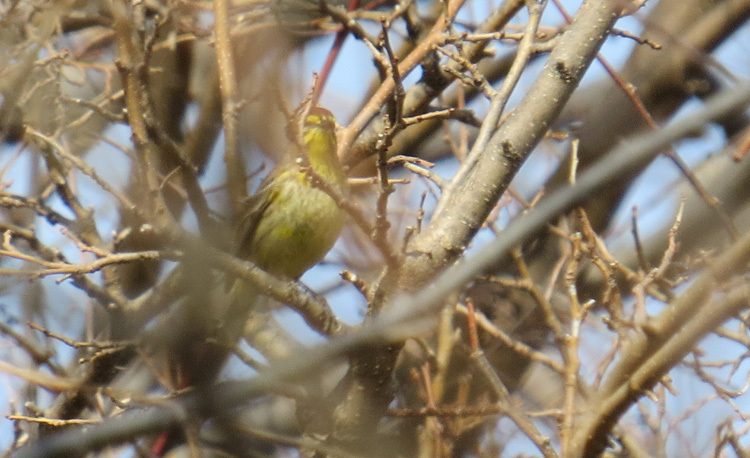 Highlights were the migrants - Field Sparrow, Chipping Sparrows, Savannah Sparrow, White-throats, Towhees, Sapsuckers, Hermit Thrush, Swallows - and this beautiful Pine Warbler! This was uber exciting on the 13th! I'm a little behind schedule with my reporting here, so a week later, it doesn't seem quite as exciting - but he sure was a beauty. That evening I had another Forster's Tern do a few flybys - along with a few more migrants... It's almost "that" time of year!